711 Islamic Berbers and Arabs (the “Moors”) invade Spain from North Africa. The caliphate they create is far more tolerant than the Christian Visigoth society they conquer. 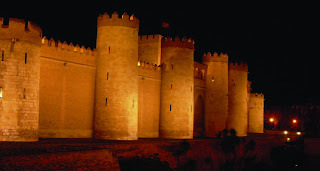 10th and 11th centuries Cordova and Toledo are the most prominent and sophisticated cities in Europe, producing important scholars, poets, scientists, merchants, and philosophers. 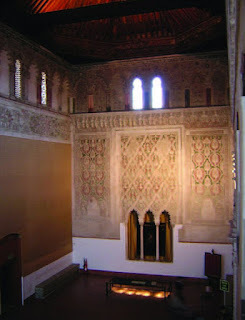 Islamic-Spanish architecture, harmonizing complex geometries, reaches its zenith. An extraordinary example of cross-cultural literary wealth, the poetic form called muwashaha, calls for both Latin and Classical Arabic versification within the same poem. 1066 The crucifixion of the Jewish vizier of Granada, and the subsequent massacre of Jews throughout Granada, mark the beginning of the end of the Golden Age of Judaism in Spain. 12th century The Muslim Averroes and the Jewish Maimonides reintroduce Aristotelian reasoning to Europe, foreshadowing Aquinas and ultimately the Renaissance. 1118 Alfonso I of Aragon reconquers Saragossa and its stunning fortresscastle, the Aljaferia, future home of King Ferdinand. 13th century The Islamic presence in Spain, under pressure from Christian forces, retreats to the Emirate of Granada, at the southern tip of the Iberian Peninsula. 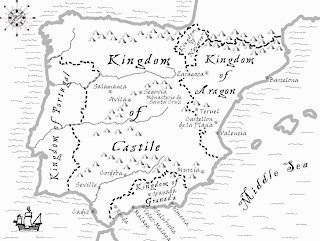 1236 Ferdinand III of Castile reconquers Cordova. Late 14th century Anti-Jewish riots throughout Christian Spain lead to forced conversions and deaths. October 19, 1469 Marriage of Ferdinand II of Aragon and Isabella of Castile. September 15, 1485 Murder of Pedro de Arbues, first chief inquisitor of the kingdom of Aragon. August 18, 1487 Auto-da-fé (religious trial) in Saragossa, the capital of Aragon, including members of the chancellor’s family. January 2, 1492 Fall of the Emirate of Granada, the last Islamic political entity in Western Europe. March 31, 1492 Expulsion Edict, aka the Alhambra Decree, ordering all Jews to depart from Spain, leaving their wealth and possessions behind. 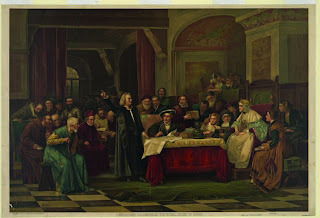 July 31, 1492 Final date for all Jews to quit Spain. August 3, 1492 Christopher Columbus’s ships depart on a voyage of discovery. October 12, 1492 Columbus lands in the present-day Bahamas. Thank you to Mitchell for stopping by and writing such an interesting post!!! 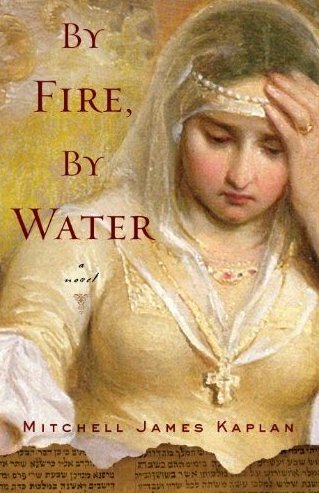 And now on to the giveaway, of which PTTP has been given FIVE copies of By Fire, By Water to giveaway! SYNOPSIS: Luis de Santángel, chancellor to the court and longtime friend of the lusty King Ferdinand, has had enough of the Spanish Inquisition. As the power of Inquisitor General Tomás de Torquemada grows, so does the brutality of the Spanish church and the suspicion and paranoia it inspires. When a dear friend’s demise brings the violence close to home, Santángel is enraged and takes retribution into his own hands. But he is from a family of conversos, and his Jewish heritage makes him an easy target. As Santángel witnesses the horrific persecution of his loved ones, he begins slowly to reconnect with the Jewish faith his family left behind. Feeding his curiosity about his past is his growing love for Judith Migdal, a clever and beautiful Jewish woman navigating the mounting tensions in Granada. While he struggles to decide what his reputation is worth and what he can sacrifice, one man offers him a chance he thought he’d lost…the chance to hope for a better world. 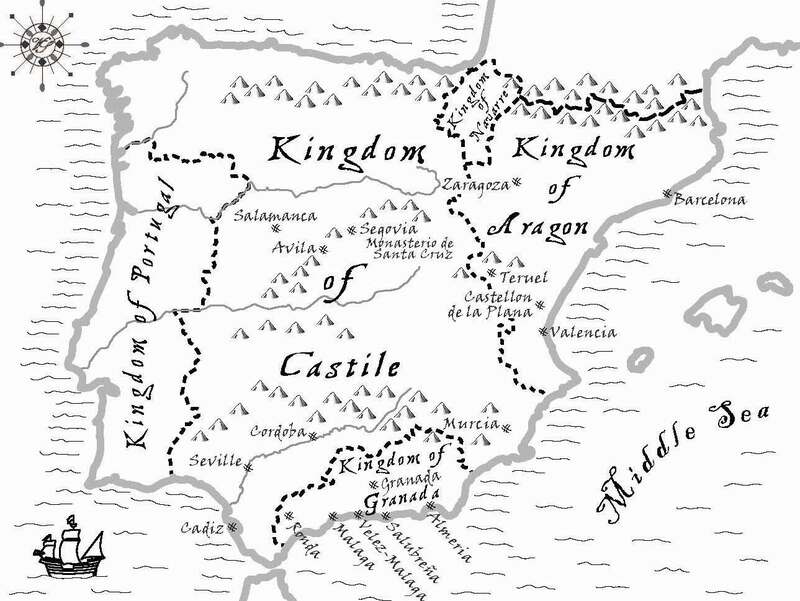 Christopher Columbus has plans to discover a route to paradise, and only Luis de Santángel can help him. EEP! I would LOVE to win this book! It's on my TBR! Sounds great...would love to read. Thanks! Ooh! I am so super excited about this book, and have been seeing it all over the place! Please do enter me in your awesome giveaway!! Oh yes! Sign me up! Thanks for the great giveaway! I have heard great things about this book. OOHH!! Pick me, pick me! I would love to read this. I would love to win a copy of this one Amy! I've been excited about this book! Would love to enter. Great post, great sounding book. I'm always amazed by how much further advanced the Moors seemed to be - more tolerant, more forward thinking, actually more 'civilized'. Thanks for the great giveaway. This one sounds so interesting. First of all, don't enter me -- have it and am starting it today! The timeline is very interesting... notice the exact year Normandy conquered England there was strife in Spain... that is also a year of Halley's comet which so many people thought auspicious. There are so many words I'm not familiar with. Must start reading! I would love to win this book. I would to learn more about Spain at this time seeing how much I have read about England, Wales, and Scotland. Very interesting note on Halley's Comet...so much to remember and so much to learn. Who needs drama when we have history to entertain us! Great post and sounds like an intense read. Thanks Amy for hosting another great read. Sounds like a wonderful book. Please enter me and thank you for the giveaway. I would like to be entered, sounds like an interesting book! I have read other guest post by Mitchell, and each one I read is very interesting. I am learning many new things which is making my interest in the book grow. I love historical fiction, and one of the things that I love most is the effort, and time authors must put into *knowing* their historical information. In other words, the research needed for good historical novels is incredibly impressive. This is a fabulous post, and what a great chance to win this book! Thanks. Very interesting post! History is so fascinating to me. Would love to read this book. Thanks for the chance! Sounds like an awesome book. Please enter me for it!! The more I read about this book and the history behind it, the more I want to read it. So many truly horrific things have been done in the name of religion. Christianity is as guilt or guilty as any other. They destroyed a thriving culture in Spain and forced 2 vibrant peoples from the land. As with many other such actions, greed and power had more to do with it all than religion. Thank you for hosting the giveaway. This is on my summer read list I would love to read this! This period in history is one of my favorites, and especially so when it deals with Spain. I recently read a novel by Phillippa Gregory about Catherine (Catalina) of Aragon and her parents, Isabella and Ferdinand. This would give me even more insight to their stories. Please enter me in the contest. Would love to read this book. Wow, this sounds like such a good book. Please enter me in the giveaway! No need to enter me. What an amazing timeline! I never realized Spain went through so many changes throughout it's history. We always read about England and France, but never Spain, which is odd since it was one of the big three back then. What a great post! Now I really want to win this! This looks fascinating! Please enter me! Wonderful post! I'd love to read more - thanks for the chance to win a copy! As a history teacher I know the basics of the convivencia, but reading about it through a fictionalized point of view makes it all so much more real! I'd love to win! Oooo, please enter me for this! I'd love to read it. This is a very nicely written post. I would love to read this book. Please enter me for this giveaway. I don't think I have ever had the urge to read a book about Columbus, until now. Thanks for the opportunity! ps. you probably don't remember me, but I just wanted to say hello! I am trying to get back into the swing of blogging ;) and have missed your blog dearly! This sounds like a fascinating read. Please enter me in the giveaway. Thank you! Hearing great things about this one! Please count me in. Thank you! I'd love to enter Amy. Thanks. This book sounds very interesting, and I would love to read it. Please enter me. Thanks! Useful info if one is interested in writing a historical. Me I just love reading them and sometimes an author will throw a shapeshifter into the mix and I really like that. Congrats on the latest release. Sounds fascinating! I'm currently studying Juana's story, so this would be a great follow up! Thank you for having this contest and for writing about such a unique and interesting story! I find the cover especially intriguing. Please enter me in the giveaway. This sounds like a delightful book, thank you for allowing me the chance to win a copy. Win a replica Catherine de Medici necklace!!! Secrets of the Tudor Court GIVEAWAY! !